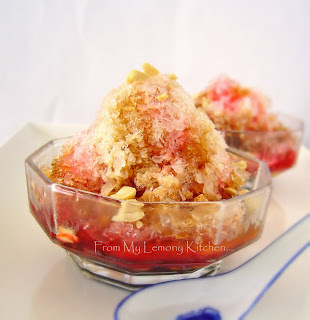 Perth's weather has been hot and sticky ... to have a bowl of Ais Kacang would be so 'heavenly'. 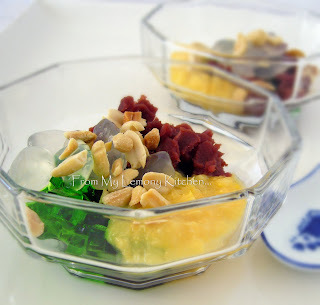 Grass jellies, red beans, creamed corn and palm seeds can be found in the Asian grocery shop. Make the syrup in 2 separate pots (dark brown sugar and sugar plus red colouring respectively), bring to boil until slightly thickened. Scoop each of the condiments into a bowl. Using ice shaver, shaved the ice cubes ...add shaved ice onto the bowl.. pour the syrups and evaporated milk... serve immediately..